You are here: Home » GENRE » Culture » The Tweed Album. From Mr B. 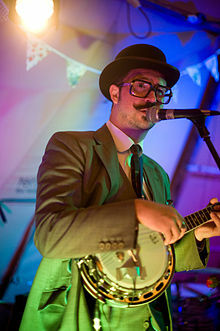 The Gentleman Rhymer‘s latest work, ‘The Tweed Album,’ we have some rather spiffing chap-core, specifically, a song called Bullingdon Breakdown. In the best tradition of the genre, Mr B. has a very interesting dis-agreement on with steampunk rapper Professor Elemental. Now, I won’t swear to it, but it rather looks like Mr B. The Gentleman Rhymer shot this song inside Walker Slater, where I buy most of my tweed. Well done, sir. Jolly well done. A man who carries tweed well. RTS goes steampunk, with Clockwork Empires. « Welcome to my opening act.